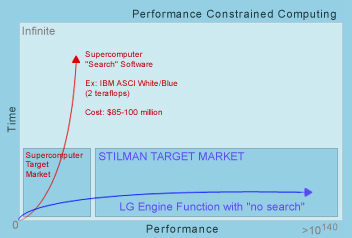 To better understand how the LG Engine could help your industry, it will be helpful to understand the larger markets where the LG software approach is far more powerful than systems utilizing the world’s fastest supercomputers. After all, with the extraordinary advances in supercomputing, aren’t we close to producing computers as smart as we are? The concept of a computer calculating one quadrillion operations per second (a petaflop), which is the machine IBM hopes to build by 2006, is mind-boggling. It’s worth expressing in numeric form: 1,000,000,000,000,000 operations per second! That’s 1,000 times faster than the Deep Blue model that beat World Chess Champion Gary Kasparov. Oddly enough, though, even this machine will pale in comparison to the strategic intelligence of the slow guy down the hall. The reason for this is two-fold. First, humans use a much more sophisticated process than sheer number-crunching speed. Second, the supercomputing method is mathematically doomed by a simple “functional” constraint: exponential growth. The exponential growth of possible responses in real-life Competitive Complex Systems makes “crunching” intelligent solutions impossible, as the number of possibilities quickly outstrips even the number of atoms in the universe (about 10^90). Searching through a number this large, even with a petaflop of processing power, would take far longer than the universe has existed. The effect of these factors is a “split” in the broader markets for high-performance computing and software. This split is represented by the gray boxes at the bottom of the graph below. We use IBM’s ASCI line of supercomputers to demonstrate the limits of computation when put up against exponential functions. The cost of these supercomputers is about $85-100 million, and they are purchased mostly by the government. Uses for these computers involve simulating nuclear explosions, sequencing the Human Genome, and other computationally intensive problems. Their use for decision-making (instead of just data mining for human decision-makers) is limited. The small box on the left containing the RED exponential function represents the current market space for these machines. With a realistic time frame, about 10^25 possibilities can be calculated. After this, the incremental gains in performance are paid for with unreasonable amounts of time. The point of this is simply that the LG Engine is capable of making strategically intelligent decisions on real-life problems in real-time. We have identified a number of markets where the LG Engine could provide much needed assistance in the optimization of resources for Competitive Complex Systems. The following partial list should enable you to envision the uses for the LG Engine across multiple industry domains.